This options are shown with a SurfaceGraphics object. 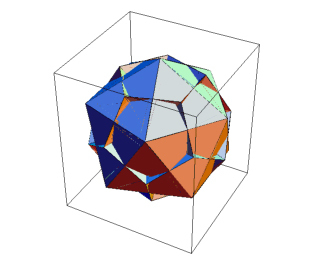 Mathematica scales the surface automatically to box ratios x : y : z = 1 : 1 : 0.4 and clips very high and low z-values. JavaView shows the surface with the correct z coordinates, without automatic clipping so the surface looks different. See 3D Options / Light. Shows no effect in JavaView. SphericalRegion is an option to scale the geometry inside the display such, that it could be rotated without exceeding the display size - this should be ever possible in JavaView. PolygonIntersections is an option for Graphics3D which specifies whether intersecting polygons should be left unchanged.